Each year a group of sailors from the U.S.S. Kearsarge are chosen to be considered for promotion to Chief. As part of this process they visit Warner in order to learn about the town and mountain after which their ship is named. 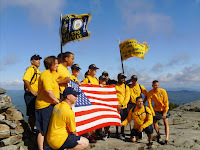 This year, 16 members of the crew will be arriving in NH on August 30. They will visit the Warner Town Hall at 9:00 a.m. on August 31 where they will be welcomed by the Warner Selectmen and American Legion Post #39. The public is invited to join the crew on a hike up Mt. Kearsarge from Rollins State Park beginning around 9:30 a.m. The crew will stop for a photograph opportunity with the staff of the Rollins State Park on the way up and spend some time on top of the mountain before returning to the picnic area to eat lunch. Please bring your own lunch and beverage. After lunch, the crew will perform some volunteer work for the park before returning to Concord. They will meet members of the American Legion Post #39 for an evening cruise and dinner on the M.V. Kearsarge. The following day they will return to Warner to visit Main Street, the local museums and have lunch provided by the Kearsarge Area Chamber of Commerce at the Jim Mitchell Park. At 5:00 p.m. they will meet at the Mt. Kearsarge plaque behind the Soldier’s Monument for a photograph opportunity before the community dinner at the Town Hall. The dinner is open to the public and is free of charge. Gifts will be awarded to the crew and a slide show of past visits to Warner and townspeople of Warner visiting the U.S.S. Kearsarge will be on view. This is an event you should not miss as the crew will share about their responsibilities aboard ship!